As consumer demand for sustainable building products continues to grow, the Metal Roofing Alliance reports another market share gain for metal in the residential retrofit market. 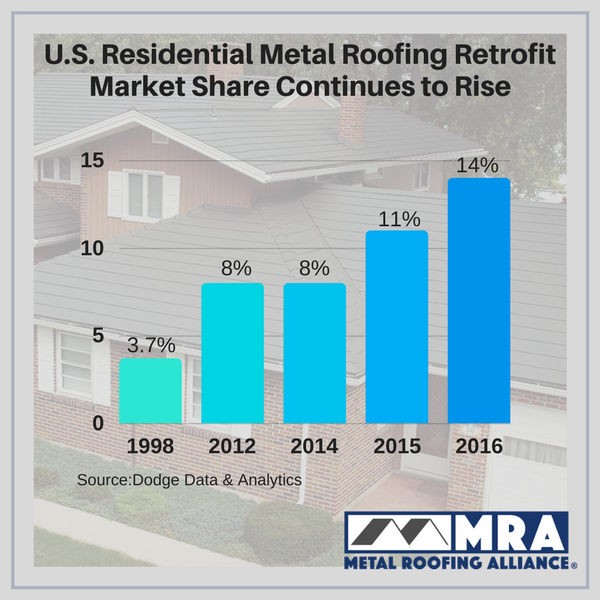 New independent research conducted by Dodge Data & Analytics on behalf of the MRA shows the total market share of metal roofing gained another 3 points in 2016, growing from 11% market share in 2015 to 14% in 2016. Between 2015 and 2016, the total demand for metal roofing increased from 17.7 million squares to 19.4 million squares. Metal roofing is second only to asphalt shingle roofing in the remodeling market. The metal roofing market share in the remodeling market has increased in six of the nine Census regions, with gains ranging between 2 to 9 points. The Pacific, East South Central and Mid Atlantic regions show advances in metal roofing greater than 6 points. The region with the largest market share is the East South Central region (Alabama, Kentucky, Mississippi, Tennessee) with 30% of homes being re-roofed with metal. In the New England region (Connecticut, Maine, Massachusetts, New Hampshire, Rhode Island, Vermont and New England) data reveals that metal roofing increased 3 points to 12% market share. The East North Central region (Illinois, Indiana, Michigan, Ohio, Wisconsin), data shows metal roofing increasing 4 points to 13% market share. Asphalt had a 64% market share in 2015 and it is now just 59% in 2016. Twenty-nine percent of homeowners reported that they selected metal roofing because it was attractive, while 20% reported metal roofing to be a good investment that added value to their homes. Longevity (18%) and strength and protection (17%) were also attributes cited for choosing metal. Standing seam metal roofing is most popular in the East South Central (Alabama, Kentucky, Mississippi, Tennessee) at 96%. In the Pacific region (California, Oregon, Washington), and the Mountain region (Arizona, Colorado, Idaho, Montana, Nevada, New Mexico, Utah, Wyoming), shingle shake tile is the most popular metal roof choice for homes. “Membership commitment to the MRA has been instrumental to our success. We invite more manufacturers to join us and enjoy the growth our efforts have produced. To think that we have areas in the U.S. that now boast 30% metal re-roof market share is very exciting and tells us that what we’re doing is working,” states Renee Ramey, Executive Director of the MRA. The Metal Roofing Alliance is a nonprofit association dedicated to educating consumers and roofing contractors to the many benefits of residential metal roofing. For more information, please visit www.metalroofing.com.